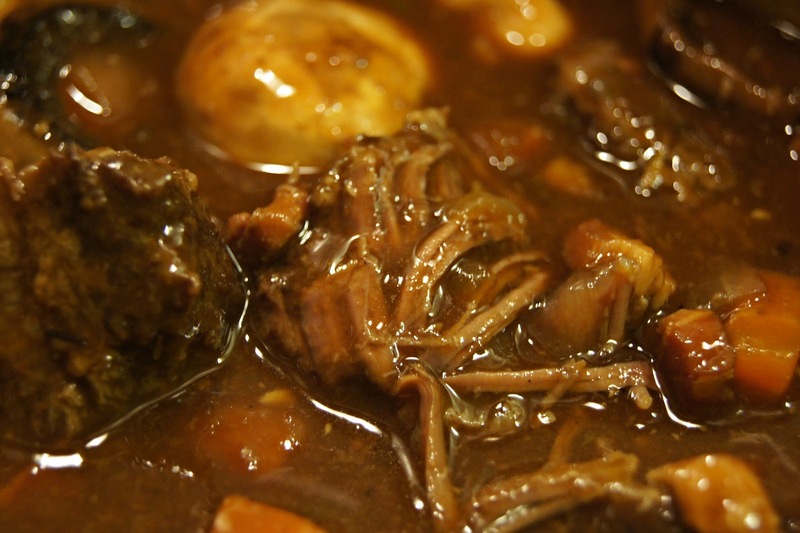 This hearty, French stew is the ultimate comfort food for a winter's evening. (For something a little lighter, try these delicious Chilli Chicken Wraps.) It might require a little effort and preparation but boy, is it worth it. There are countless recipes around for this classic but this is mine, with some extra tweaks to maximise taste divinity. 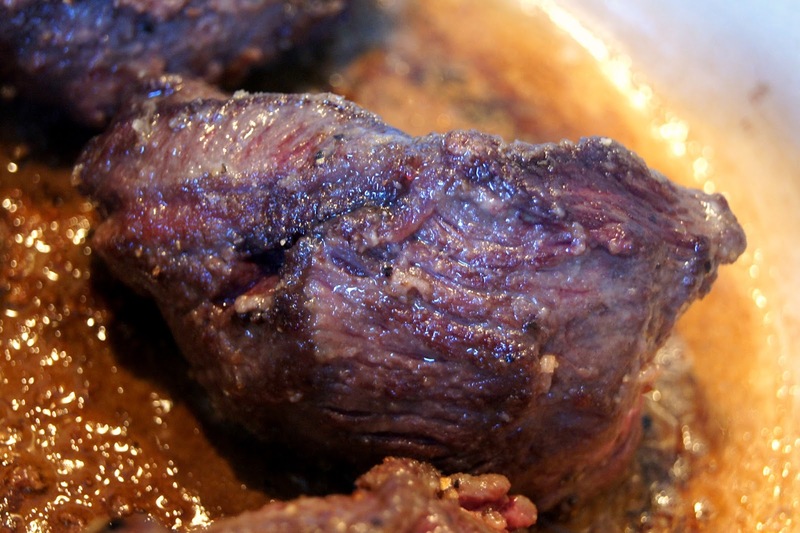 2 ox cheeks (here's my first tweak, you can use a more traditional cut like chuck or shin of beef but ox cheek a) is full of flavour, b) have the most unbelievable melty texture and c) they're absurdly cheap. 20 or so button/pearl onions or little shallots. 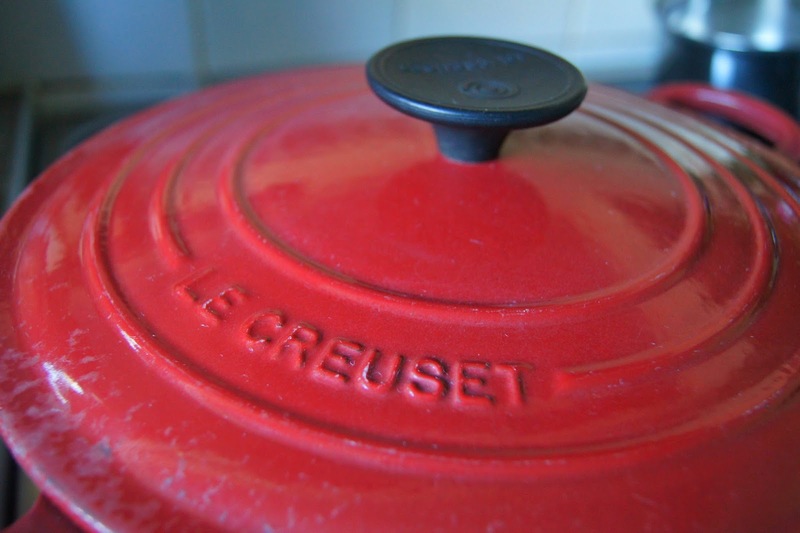 First, start off by getting yourself a well-loved, cast iron casserole pot. Pop it upon the stove and fry off your bacon until it sizzles. Toss in the chopped carrots, onion and celery with a little olive oil to help them along and a sprinkling of thyme. Fry for 5-10 minutes or until they start to get some colour. Set aside. 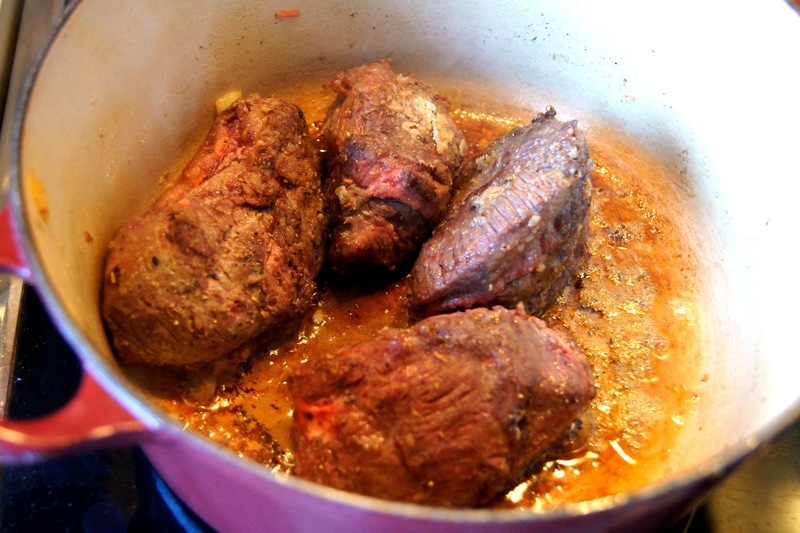 Next, cut your ox cheeks in half and toss in seasoned flour. Crank up the heat and brown in the pan with a little more olive oil. This is an important moment; browning the meat gives the stew it's flavour so get some good colour on those cheeks, then set aside with the veg. Deglaze your pan with the wine making sure to scrape all the charred goodness off the bottom. 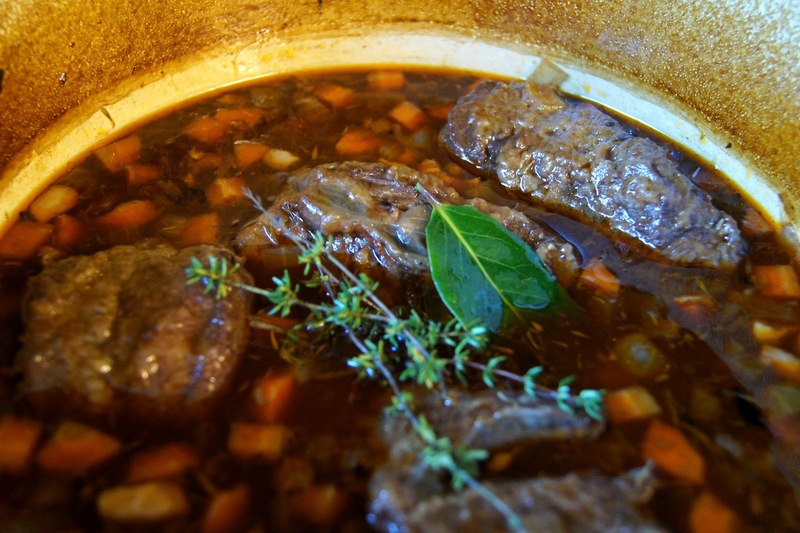 Reduce the wine slightly to take the edge off the alcohol and add your stock and tomato puree. Boil rapidly for a couple of minutes then you can turn off the heat. Add your meat and veg back into the pot, top with herbs, on with the lid and into the oven at 140-150 degrees C.
As Nigel Slater says, a boiled Bourguignon is a spoiled Bourguignon, so these little ox cheeks require long and slow cooking, I leave mine in a low oven for anything up to 6 hours, arguably the longer the better, but 3 hours should do. 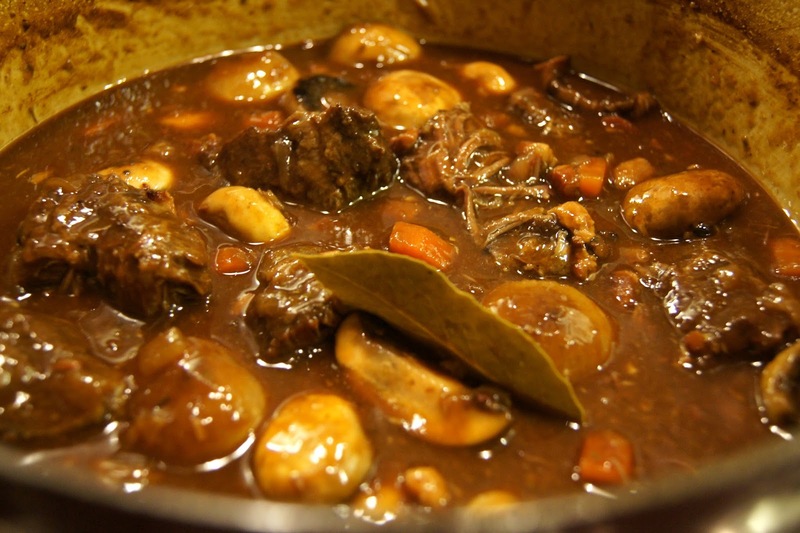 Whilst your Bourguignon is cooking away, you can get on with some little extras for extra flavour. Peel your teeny onions and add whole into a frying pan with some olive oil and a little seasoning. Fry on a medium heat to get some colour on them then turn down and cook them through. At the end of their cooking, (a knife should pierce them effortlessly) add a knob of butter and a splash of balsamic vinegar (another taste tweak). Reduce until the onions are coated in a sticky, dark glaze. Chop your mushrooms into halves or quarters and fry in a little olive oil and butter. Throw your unpeeled cloves in a stainless steel pan with some salt and olive oil. Cook on a low heat until soft, just like roast garlic and you can squidge them out of their skins. These caramelised, confit cloves are fully delicious squashed into the stew. When your meat is tender and yielding, and falls apart at the slightest prod, your Bourguignon is done. Toss in your onions, mushrooms and garlic and cook for a few minutes, so all the flavours get to know each other. Serve with buttery mash, toast with persillade or really, whatever you fancy.